Studies on the Maharishi Effect repeatedly demonstrate that the rate of crime and violence within society drops significantly immediately after a group of experts in Maharishi's TM-Sidhi Program exceeding the square root of one percent of the population is assembled for twice-daily practice. This effect has been demonstrated repeatedly in countries around the world. For example, a demonstration project was conducted in Washington, DC, in 1993, at the time that violent crime in the capital was at record high levels. 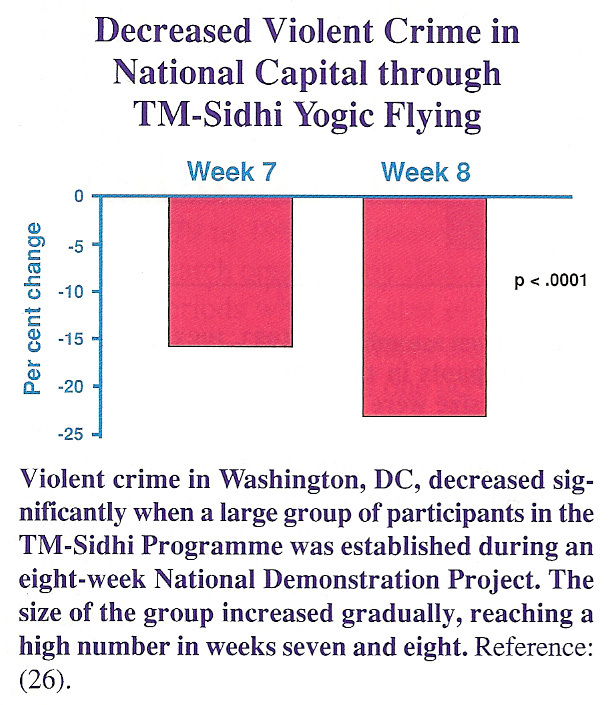 A large group of Yogic Flyers assembled in the national capital during a two-month period, for the purpose of reducing violent crime by creating coherence in collective consciousness. Careful statistical analysis indicated that violent crime significantly decreased, and this decrease was proportional to the size of the group over the 8-week period  (Refer to chart below.) These results were published in the journal Social Indicators Research. Many research studies also show that during periods in which the number of experts practising Maharishi's TM-Sidhi Programme is sufficient to create the Maharishi Effect, economic indicators improve, as measured by such variables as reduced inflation and unemployment; and quality of life improves, as measured by overall indices that include many social variables. For example, a permanent group of Yogic Flyers has been established at Maharishi University of Management in the United States since 1979. During the periods in which the size of this group exceeded the square root of one percent of the US population, there was a significant improvement in the quality of live of the whole United States as measured by a monthly comprehensive index composed of data on homicides, suicides, motor vehicle fatalities, fatalities due to other accidents, incidence of disease, alcohol consumption, and cigarette consumption . (A decrease in these variables has been considered as an improvement in the quality of life). During periods when the size of this group of Yogic Flyers exceeded the square root of one percent of the combined US and Canadian populations, the same result was found for Canada . All these scientific studies taken together clearly demonstrate that group practice of the Maharishi Technology of the Unified Field, including Yogic Flying, is fully capable of creating coherence in the collective consciousness of the nation through the principle of the Field Effect. Furthermore, scientific research verifies that this same technology for creating coherence in collective consciousness can also be successfully applied for peaceful conflict resolution between nations, and to create world peace.